There is a lot of speculation on shoe trees and their importance in relation to footwear. Some common “facts” in reference to shoe trees may seem like truth, but could just be the outcome of genius marketing and branding. 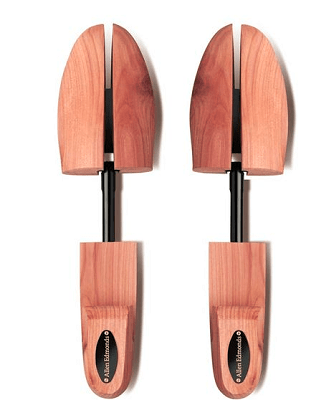 If you’re going to invest in quality shoes, the smart thing to do would be to invest in shoe trees. Yes, they look old-school (and they are, having been developed in the 1820s) or like something Gepetto may have made in his workshop, but the best shoe trees are definitely worth it! Now that you’ve had a chance to take a look at each of the best shoe trees, you’re probably wondering about them more in-depth. Scroll down a bit further to read in detail about each one you have your eye on! Are you sick of having to step into damp loafers? Perhaps you’re just looking for the best shoe tree to help show off your footwear collection? 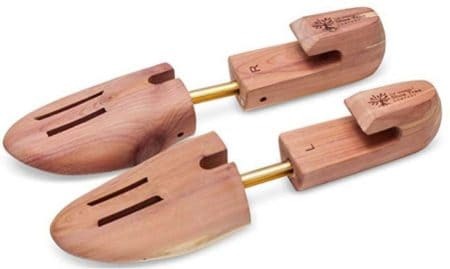 If either of those situations fit what you’re looking for, then you need to check out the Stratton Cedar Shoe Trees! First off, you may notice that the tree features two-part ventilation slots at the toe. It may not seem like much, but they actually make a pretty big difference between those that don’t have them. The ventilation slots allow the moisture to be released out of the shoe, rather than just settling there, with no way to escape. In fact, most shoe manufacturers recommend the use of trees with ventilation slots such as these. In addition to that, the trees are made from the aromatic heartwood of premium red cedar. Not only does this keep your shoes smelling great, but it actually helps absorb moisture and odor. Obviously, a large part of the shoe tree function is to help preserve the intended shape of your shoes. The Stratton Cedars do this by use of their gentle spring-loaded technology that doesn’t force the shoe any way it’s not intended to go. Something, in particular, we also really enjoyed about these were the way they efficiently flatten out creases. It’s surprising how many shoe trees cannot do this, but unfortunately, that’s the way it is! So, was there anything we didn’t like about them? The only thing we really weren’t fans of, was that they seem to come loose rather easily, so keep that in mind. Looking for just a quick, easy product to keep your shoes looking and smelling their best? 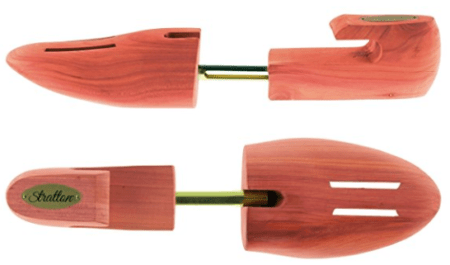 Check out the Woodlore Cedar Shoe Trees! 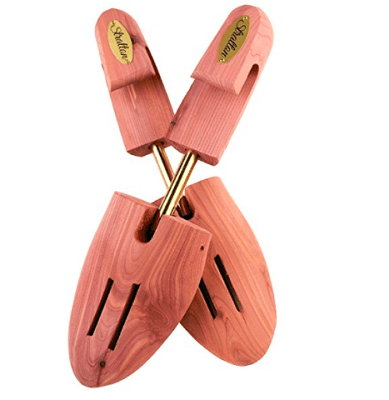 Upon receiving your shoe trees, you’ll notice that they smell wonderfully natural. This is due to the fact that they’re each made of cedar, complete with a cedar sole. The aromatic cedar not only keeps your shoes smelling wonderful, they also help to absorb moisture that may be inside of the shoes. Each of the Woodlore cedar shoe trees is made in the United States, so you can feel confident about the quality of shoe tree that you’re receiving. You won’t have any surprises in seeing your trees are actually made in China, or somewhere else not mentioned. Not only do they keep your shoes dry and smelling great, they also work to help prevent any cracks or creases in delicate leather, which is essential in keeping them looking their best. They can each be easily adjusted according to length and toe width. Let’s get to the “cons”, shall we? Our biggest complaint was that the sizing was pretty confusing. There is a sizing chart that comes along with the shipment, but it’s important to also look online for sizing to make sure you’re receiving the right size. If you’re into shoe trees at all, you’ve probably already heard about The Original Shoe Tree Company. We hadn’t heard of them until we started our guide, but for us, we have nothing but great things to say! When you receive the shoe trees, you’ll see that you get one pair of shoe trees (obviously), along with a bonus shoe bag. This is an oversized bag which is perfect for keeping your shoes safe while traveling, or just while storing them in the closet. But, let’s get to the actual shoe trees! You’ll probably immediately notice the crisp, cedar aroma when you first open the package. Each one is made from cedar grown in the US and is of the highest quality. The cedar functions as a way to both eliminate and prevent odors, while also absorbing any moisture that may have collected in your shoes. Each one features a laser-etched mark indicating whether it’s the left or right shoe tree. It may sound simple enough without the markings, but believe us, it can be more difficult than you’d think! The exterior is soft and smooth, and the slide in quite easily inside the shoe without any hang-ups or force. To help with the ease of use, there’s also a quiet-glide, adjustable spring which ensures the trees move according to your shoes; not the other way around. They also have the coveted double vents in the front of the tree, to help release any moisture that may have been absorbed by the wood. Not really, but if we had to, we’d say that we noticed after a while, the cedar scent did diminish a bit (not entirely). If you want to get it back, you can use some sandpaper! 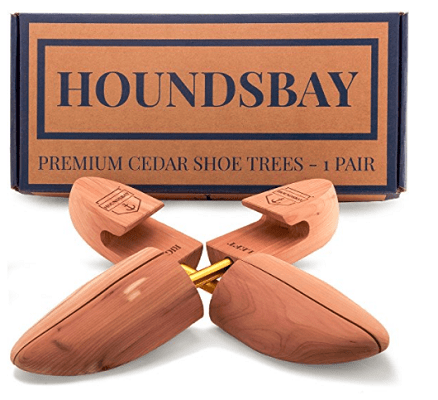 The HoundsBay Cedar Adjustable Shoe Trees along with the Original Shoe Tree Company trees were really hard for us to choose between. They each have their pluses and minuses, and this one is another amazing product! Made from red cedar, the aroma naturally dissipates odor while simultaneously absorbing moisture to keep your shoes preserved as long as possible, in their original state! Each one is made up of 75% heartwood, rather than sapwood that so many competitor shoe trees are made from. Something else unique about this shoe tree brand is the split toe. It actually opens once inside your shoes, to create a snug fit, and further prevent and eliminate any wrinkles or lines in the leather! The wide heel of the trees helps to further preserve the original shape of your shoe, from toe to heel. Many products feature slim heels, which actually can damage both the shape and stitching of your shoes over time! Something that we only saw with the HoundsBay Shoe Tree? 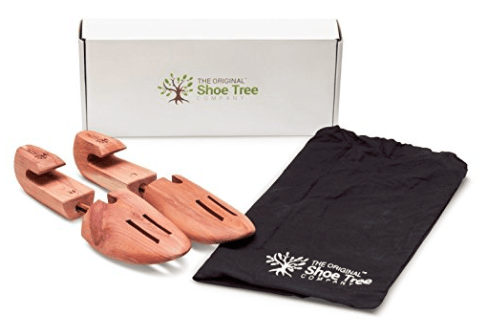 For every pair of shoe trees purchased, they plant one tree in the United States. This works to help our planet and the people who inhabit it, which shows the company is not only effective in their designs but morality. There weren’t any really, but if we had to nitpick, we’d say that some users may like them to be a bit wider in place of the split toe. That’s more of a personal preference, however. Now that you’ve had the chance to go through each one of the products in-depth, you may still be on-the-fence about which ones to purchase. We found two favorites! Our personal favorite was The Original Shoe Tree Company’s products. They come with a handy, oversized bag to protect your shoes during travel or storage. In addition, they are easy to apply and take out with the gentle-removal hook. They are made of cedar which not only smells nice but also works to absorb odor and moisture. Our other favorite is none other than the HoundsBay Shoe Tree. It’s also made of cedar, but rather aromatic red cedar to absorb moisture and odor more effectively. It has a split-toe which opens gently inside the shoe to help preserve the original shape. The wide heel assists in doing this and also helps preserve stitching of the shoes. So, which of these best shoe trees will be making their way into your closet?